As you might have noticed, there’s some new “stuff” from New Jersey popping up on Laughing Frog Images. I’m still processing and sorting out the vacation photos, and this little run of NJT and Amtrak is what you might look at as “low hanging fruit.” The day job has been really busy of late, so I’m making do with what I’ve got to work with. I managed to catch NJT ALP-46A electric locomotives (4600 series numbers) and ALP-45DP dual mode diesel and electric locomotives (4500 series numbers) in some sweet late day sunlight, which has given me the chance to add to the NJT Gallery on Laughing Frog Images. I haven’t been a good student of the NJT fleet, and when I saw the first 4500 roll by – I noticed that it only had one cab. Of course, that happened while a cloud was stealing my sun, so that shot didn’t make it to the gallery. I was starting to watch the clock, as the time for my train was drawing near. And I saw an ALP-46A. And then another one. And then – you guessed it, another one. And the clock kept ticking… The last train before mine was headed up by a 4500, and that image did make the gallery. When I had some time to research the 4500s, below is what I found on the Bombardier website (the link follows as well if you want to look at some of the technical information that’s posted). New Jersey and Montréal: Two metropolitan regions, similar challenges. Only a few electrified tracks for passenger transport are integrated in a well-utilised freight transportation network with diesel traction: a heterogeneous infrastructure that often forces passengers to change trains. To overcome such system limits and to markedly increase travelling comfort, both NJT and the Canadian Agence Métropolitaine de Transport (AMT) utilise Bombardier’sALP-45DP. This modular locomotive combines the technology used in the bogies, the locomotive body and the propulsion of the ALP-46A. However, two further diesel engines are also integrated. Because the DP locomotive is used in push-pull operation with double-deck coaches, it also has a pantograph and driver’s cab. So, while it was a brief wait at EWR for my train, it was an interesting one, as I managed to catch a new locomotive that quite frankly, I wasn’t even aware of! Thanks for looking! Enjoy this brief look at how many folks in Jersey travel every work day. It has to be better than I-10 in Los Angeles County…. One of the nice things about waiting to see a train at the NJT / Amtrak Newark International Airport Station is that you’re generally going to see trains, especially if you’re waiting during rush hour. Occasionally, you’ll see multiple trains at once – I’ve been able to capture three trains at once in a still image. Not a great still image mind you, or else I’d be posting and talking about that, but I’ve done it. There are times where it’s a busy 45 seconds at Newark. And there are times it all comes together. And the Acela slides on through the station. Then, I hear another train behind me – I have no idea what it is or what track it’s on, and I can’t turn around without really screwing up this hand-held video. So, I try to stay still and just keep the video rolling. I let it roll until the northbound Amtrak is out of view. Until 45 seconds at Newark are memorialized. An Amtrak local comes into view, cab car first. Ok, that works! And then, in the golden light of late afternoon, I hear the “psst”s (yeah, I know that’s not a word, but I don’t know how else to try to phonetically describe the sound) of the locomotive – and I still can’t turn around to see it. And then, an AEM-7 in push mode glides by me. And I’m happy, because I finally got a great video clip of an AEM-7 in sweet light! You see, the AEM-7’s are being replaced after 30+ years, and I don’t get an opportunity to see them very often, let alone get a video in sweet light. For all I know, this is the last time I’ll get an AEM-7 on video. So, it was a good day. One day, I might even find that miracle tripod that you can take with you on a whirlwind transcontinental business trip. In the meantime, enjoy, hand-held and all! While waiting for my train at the Newark (NJ) International Airport Station on Amtrak’s Northeast Corridor, I pulled out my trusty Nokia Icon and made some images and videos. As this was a business trip, I wasn’t traveling with a tripod. 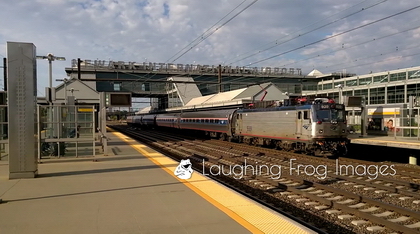 So, the pictures are fine, and the videos… well, a couple of them turned out well enough to share on the Laughing Frog Images YouTube Channel simply because they’re a little different. Here’s the first one – Gone in 8 Seconds. Why “Gone in 8 Seconds”? Well, I had something different in mind when I shot this New Jersey Transit (NJT) train that’s carrying people home (or somewhere else) from Manhattan. There are a lot of train videos out there that hold one camera position and allow you to see the entire train as it comes by. They’re usually a 3/4 angle view parallel to the tracks. And, there’s nothing wrong with that. When I saw the train coming, I framed up my shot and hit record when I could hear the train (not as simple as you think – they’re electric, and pretty quiet). My goal was to replicate his view – look at the train from a hard angle and watch it blow by the camera. Which it did. In about 8 seconds. So, in case you ever wondered what it would be like to be sitting on a bench at the Newark International Airport train station and watch a train blow by you in about eight seconds, you now know what that’s like. 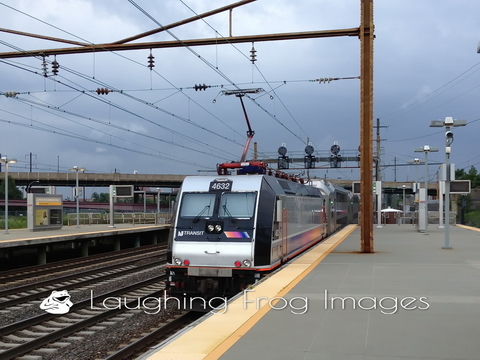 Next in the new galleries showing images of railroading in the Northeast Corridor is a small (for now) gallery of New Jersey Transit (NJT) trains and EMUs. Well, it’s not an animal, at least in this case. EMU stands for Electric Multiple Unit, and the reality is that an EMU is a self-propelled passenger car (with or without a control cab) – an EMU doesn’t need a locomotive to move. NJT operates passenger trains moved by diesel-electric locomotives, electric locomotives, and EMUs. This gallery is a small sampling of what moves through the Newark International Airport station that is shared with Amtrak on the Northeast Corridor. NJT operates commuter trains on routes that date back over 100 years. Trains run on lines formerly operated by the Pennsylvania Railroad, Erie Railroad, Lackawanna Railroad and Central of New Jersey Railroad. I think that’s it – but it’s possible that the Lehigh Valley Railroad might be a part of that group as well. Unlike what happened out here in California where they put the rails back in where they tore them out, there’s a long history behind the services provided by NJT. But this is about trains – so back to the subject at hand. You can learn more about New Jersey Transit from their website or from our friends at Wikipedia. 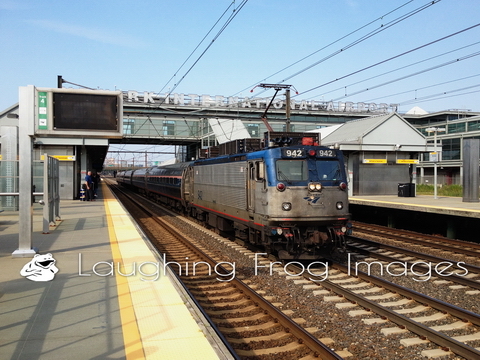 You can check out the NJT Gallery on Laughing Frog Images and get a glimpse of how people commute in New Jersey. As I’ve been moving and organizing and backing up image files, I stumbled across some iPhone images of passenger railroading on the Northeast Corridor, and I’ll be adding a few small galleries to share images of how others travel and commute. The first of these galleries will be of Amtrak. Several of these images are instant history, as the 900-series AEM-7 locomotives are well into their 30’s and are being replaced by new locomotives. If you’ve never been around trains powered by electric locomotives, it’s different because they’re quiet. Very quiet. If the engineer doesn’t blow the horn, sometimes your only clue is the sound of the wind created by the train. If the wind is blowing the sound the other way, you might not even get that. It’s actually pretty neat to experience it. I often travel by Amtrak between work locations in CT, NJ and MD – it’s really the only way to go. Public transportation on the East Coast may not be perfect, but it’s pretty darned close if your basis for comparison is the Los Angeles area. The photo above was taken at the Newark International Airport Station (yes, we do have shreds of logic where different modes of transportation connect!). 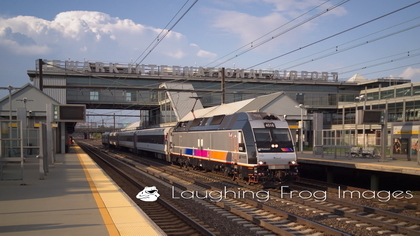 So, if you’ve always wondered what the trains look like “over there” and you’re curious, waste a little time and head over to the Amtrak on the Northeast Corridor Gallery on Laughing Frog Images.